My adventures with stripes and fringe are still going strong, and projects are chugging along at a much better pace. I had thought that I would want to try a new project once the latest necklace was complete, but I was still really in the mood for fringe, and herringbone necklaces are just the most satisfying way to use it right now. For the new necklace, I had a craving to do something a little more Egyptian, so I put together a jeweled palette. I was a little worried at first that the pattern would end up being too busy. I think once the entire piece is complete and the fringe is added it will come together just fine. The last necklace turned out great. I hadn’t given any thought to accent beads when I chose my palette, and it turns out that the only thing I had in my stash that would match with the opaque colors was African Christmas beads. This is perfectly fine by me! I had fun picking out just the right beads to use and putting on the final touches. There are so many different ways to find color inspiration in the seasons, and many of the ones we turn to again and again are natural. For summer this might be the colors of the beach, summer fruit, or even a purple-and-gray thunderstorm palette. Then again, traditional and nostalgic color palettes are pretty inspiring as well – like the red, blue, and white of a rocket pop. This summer, I wanted to explore some colors that would bring to mind some of the best things about getting out in the sun, and perhaps the scent of coconuts. The first palette was so easy to create. Nothing says sunscreen like aquatic blues and yellows. For this Kids’ Sunblock trio I used canary yellow, transparent capri blue, and opaque turquoise blue. It’s fruity and vibrant, and definitely has a beach feel to it. I would love to see this palette in something with lots of exotic, playful fringe. Next I went in the opposite direction and concocted a trio for lovely coconut scented Suntan Oil. I started with opaque terracotta, though I would have loved to use some transparent rootbeer as well. Next I added smooth orange luster and lustered pearl cream. This palette has so much warmth. I think it would look great in a spiral design, particularly a double spiral rope with lots of chunky accent beads. Finally, I combined both of these palettes for a final trio inspired by everyday Sport Sunscreen. This time I went with the transparent rootbeer and opaque patriot blue, finishing with a dark Ceylon cream. This palette is more shea butter than coconut, and would be perfect for a geometric cuff or perhaps a colorblocked rope. What colors and scents make up your favorite summer inspirations? I have been enjoying my summer down time immensely these past few weeks, just working and relaxing – and getting lots of beading done. I have definitely found a good groove with working multiple projects at once, and giving myself permission to pick up whichever one I happen to feel like working on at the moment. It also helps that I have a great series to watch to keep me coming back to my workspace. Star Trek: Voyager got me through the coconut necklace, the last mini collar in my scrapped challenge, and the new stripe necklace. It was a treat to finally complete the fringe necklace. I picked a fun assortment of beads for the strands, including a couple that I purchased while on vacation. 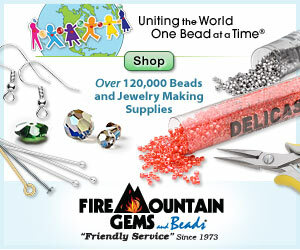 I couldn’t resist popping in to the bead store that caused a lot of confusion for me last year. It’s still the same, but since I didn’t pick up any of the bone beads last time, I decided to give in just for fun. I only spent $1.50, but I felt happy about adding something to the design that I didn’t have on hand before. I’ve decided to continue working with stripes for the time being. Looking back, I realized that no matter what type of project I’m working on, if it has stripes – particularly black and white ones – I never get bored or feel like the project is taking too long to complete. I’m usually pretty content to keep stitching stripes. The new necklace will be another herringbone rope with fringe, which will give me a chance to play with lots of different accent beads. I find that this is a great way to keep from getting a creative block – there’s very little commitment to using a mix of lots of different beads in small quantities.